The contentious bill that has citizens’ movements, environmental groups and Plaka residents up in arms over the dire consequences it will create should it go into effect is under re-examination, the environment ministry said over the weekend. The ministry said it was planning to withdraw certain amendments made to a draft law that would in effect change property use paving the way for commercial development in the traditional Athens borough, at the foot of the Acropolis. The ministry, which also withdrew three controversial provisions that foresaw declassification of forests including cases where reforestation efforts have proven futile within a five-year period, has invited Plaka residents and organizations to an open discussion in efforts to silence criticism ahead of presidential elections. Last week, residents, environmental groups, diaspora Greeks and Athens associations described the bill as lacking transparency. In a letter to Deputy Development Minister Nikos Tagaras, Athens Mayor Giorgos Kaminis called on the government to withdraw the provisions of the bill, adding that “any intervention to the shaky legal framework of land use in these Athens areas cannot be attempted without serious preparation and prior consultation with the municipality”. 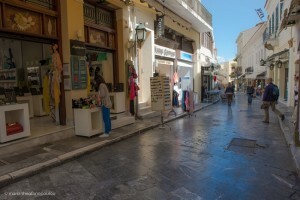 In the meantime, citizens’ movement for the protection of Europe’s cultural and natural heritage Europa Nostra also expressed its concern over the recent bill in a letter to the development ministry, saying it is imperative that existing legislation on land use applicable to Plaka remain unchanged. Europa Nostra awarded the Greek government in 1983 with the Medal of Heritage Conservation, recognizing the cultural and historic significance of the Plaka district not only for Greece, but also for the whole of Europe.